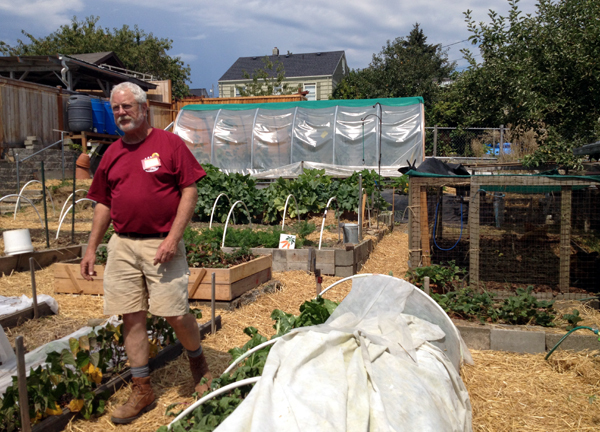 The Manette Edible Gardens Tour is one of my favorite garden tours of the year, mostly because of its local, homegrown feel. 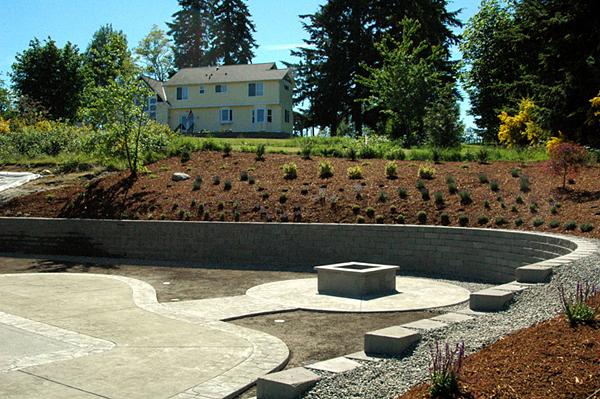 Manette community members come together to organize this annual event, opening their gardens and landscapes for the public to experience first-hand. For a donation of $5, one has access to the most welcoming gardeners who freely share the knowledge they’ve accumulated over the years. 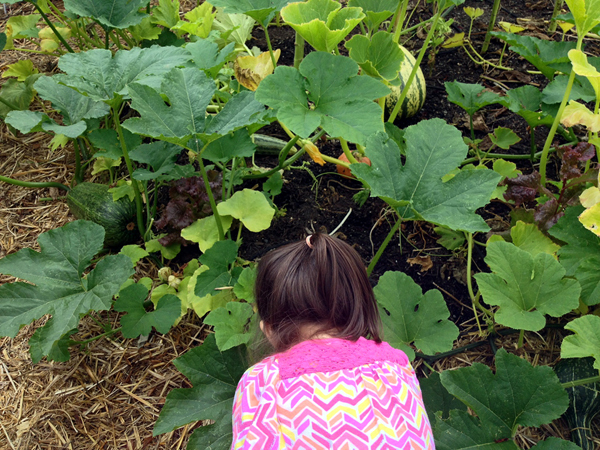 Last August, I took my niece and nephew with me so they could see food being grown and available in one’s own back yard. By the time we left Manette, they had handfuls of garden booty! (Turns out, gardeners are incredibly generous people.) The tour is a great experience for children, and this year’s tour included activities such as face painting and a scavenger hunt. Colby accompanied me this year. 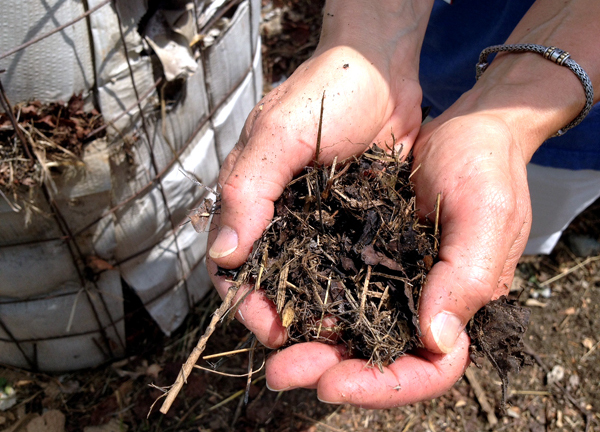 While we didn’t see all of the twelve gardens on offer, we received a wealth of great composting tips at Nano Farm. Coffee grinds layered on top of your pile will hide smells, hopefully keeping animals away. Don’t add receipts to your compost; something in them kills the worms. Also, place a bucket of water next to your bin to wet your carbon before putting it in the pile. This is a great way to keep things moist. 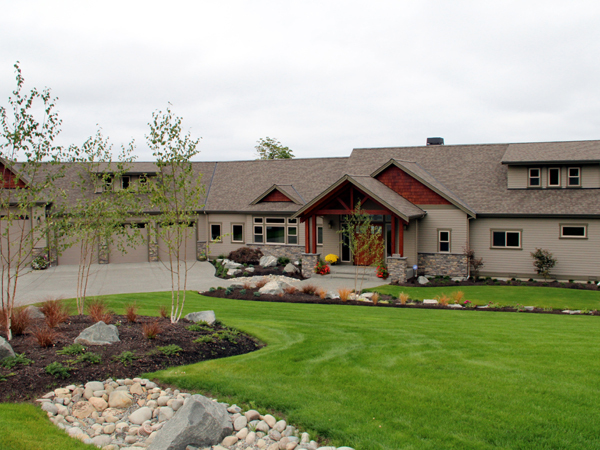 We were very impressed by Nano Farm which belongs to homeowners Eugene and Deborah. Upon walking up to their home, we were greeted by a spread of their garden bounty, which included canned and pickled items. 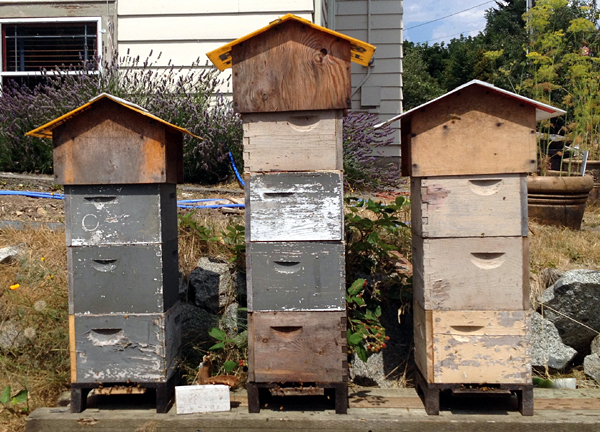 Nano Farm features sustainable watering systems, a chicken coop, fruit trees, bees and more. Managing this garden is more than a part-time job and Eugene, a great steward of his land, is up to the task in every way. He was, after all, part of a grassroots coalition that helped to “legalize chickens” in Bremerton. Using simple yet incredibly effective technology, he captures water from his garage to water his garden. Being retired, he also has the time to keep bees. It was a great afternoon. 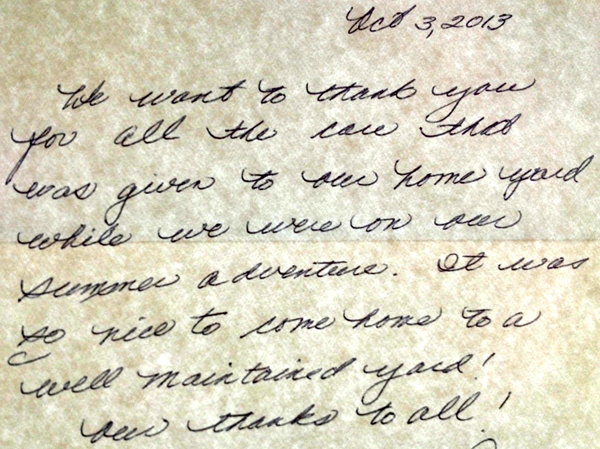 We appreciate seeing folks doing what they love and doing it well. 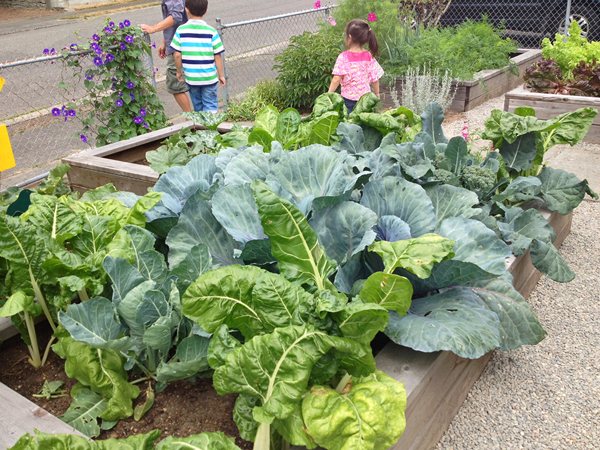 Cheers to the good people of Manette and everyone involved with the Manette Edible Gardens Tour! 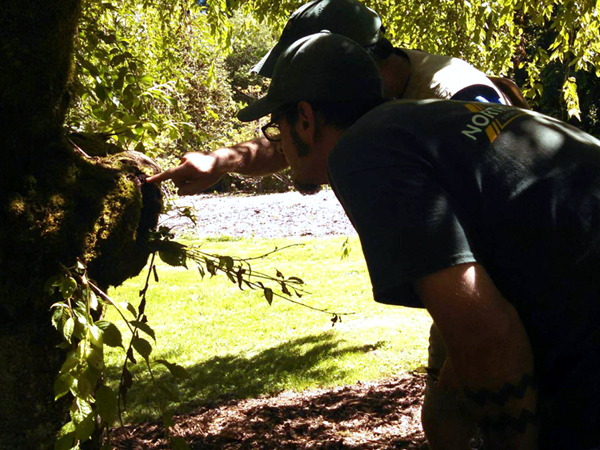 In July we had the opportunity to attend a summer pruning workshop in Seattle coordinated by the UW Botanic Gardens as part of their professional horticulture education series. Two of our maintenance leads, Phillip and Ray, were in attendance. 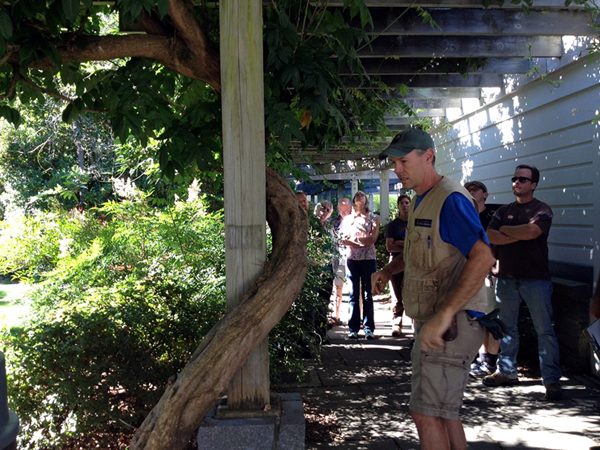 Phillip and Ray listen as an arborist discusses what factors to consider when selecting a tree’s leader. 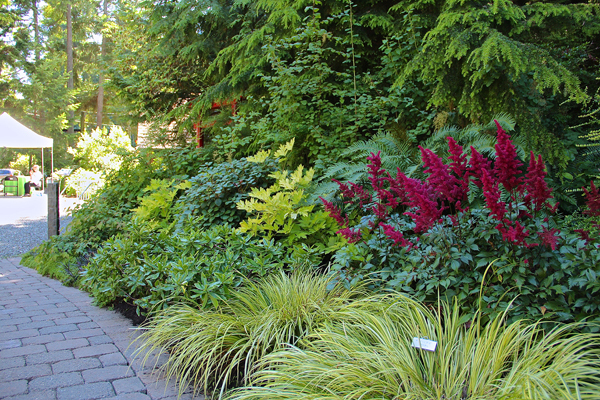 This outdoor demonstration class was taught by professional horticulturists and arborists on staff for the Washington Park Arboretum along with Bess Bronstein, an instructor for the Edmonds Community College horticulture program since 1989. If you love learning about plants and are interested in taking a horticulture class, Bess Bronstein is a fantastic instructor to learn from. She delivers information with wit and humor and knows how to keep a class engaged. We learned how they train the wisteria vines on site and how to achieve more flowering. So what exactly should you prune? Remove the 3-D’s: dead, damaged and diseased branches. Remove undesirable growth (the 4th D- deranged! ): rootstock suckers, water sprouts, plants prone to suckering regrowth, etc. Prune bleeders. Some genera tend to bleed sap during dormancy, so summer pruning is neater. Bleeders include: maples, dogwoods, birches and beechers. Prune plants prone to fungal diseases: Prunus species of trees (flowering plums and cherries), maples and dogwoods are prone to fungal disease spread if pruned during wet winters. 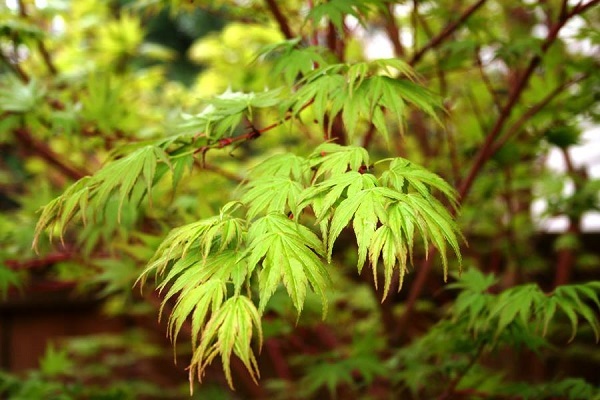 Fine prune thin small branches/leaves of Japanese maples to enhance branch view. Hedge broadleaved evergreens to allow some regrowth prior to low temperatures returning. And why prune in the summer? Pruning during the summer months is somewhat of a no-brainer considering the long stretches of dry weather we experience. Besides keeping dry, listed below are other benefits of summer pruning. You can see where it’s dark and where a plant won’t flower, allowing you to make informed decisions about how to allow more light to filter in. By mid-July top growth is essentially finished. The bulk of growth has been done, but plants haven’t started storing food yet. The optimal time to prune is between mid-July and mid-August. If you prune after mid-August, you risk stimulating new growth at the same time plants are trying to store food, and this can be stressful for the plant. Summer pruning results in a “stunting” or “dwarfing” growth response – great for size management. It’s an opportune time to manage temporary branches and emerging competing leaders. Ray looks at the effects of Cherry bark tortix, a moth whose larvae can kill cherry trees and infest woody trees and shrubs. Continuing education is incredibly important to us. It allows our employees to grow their knowledge about their field, and this knowledge is then directly applied to our maintenance clients’ sites. To learn more about the UW Botanic Gardens continuing education horticulture workshops, click here. We offer three concrete finishes for patios, driveways and walkways: broom finish, exposed aggregate and stamped or decorative concrete. 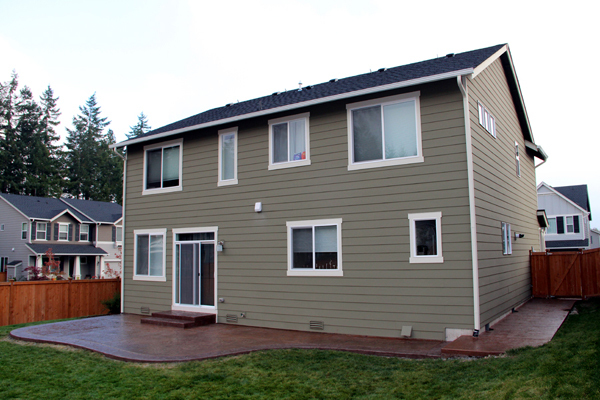 With all of the customization options available, such as staining your concrete to match your home’s trim, or opting for a stamp that resembles your chimney’s veneer, concrete’s popularity has grown over the years and it’s easy to why. Broom finish – also referred to as brushed finish – is the most basic option of the three. Since it’s the less labor intensive of the three finishes we offer, it’s also the least expensive. Broom finish simply involves pulling a purpose-made broom over the surface of the fresh concrete, once the concrete has been levelled. The resulting texture varies depending on the hardness or softness of the broom that’s used. A hard or stiff broom results in a coarser texture, while a softer broom achieves a lighter texture. The texture, in turn, determines what kind of traction the finish will give, an important factor we consider when constructing a concrete driveway. 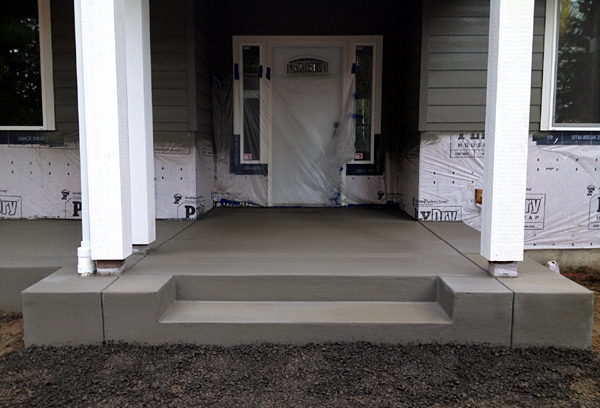 Exposed aggregate concrete is a common finish for sidewalks, walkways and driveways. 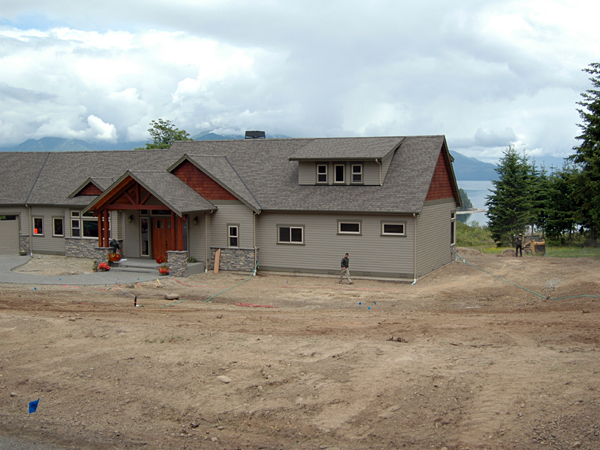 The concrete mix used for this finish contains a specific amount and type of aggregate such as pea gravel. 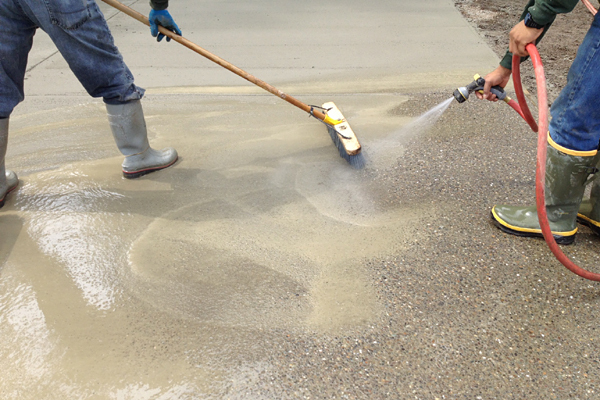 After the concrete has initially set, the exposed aggregate surface is revealed through a process that involves washing away the surface of the concrete with brooms and a water hose. Washing away the top layer of concrete exposes the internal aggregates of the concrete mix, hence the term “exposed aggregate.” Though pea gravel is commonly used, a discerning consumer can select from other beautifully colored, river tumbled aggregates if he or she so desires. The price of the project increases, though this decision is a worthwhile investment as concrete driveways and patios can last for over 20 years. 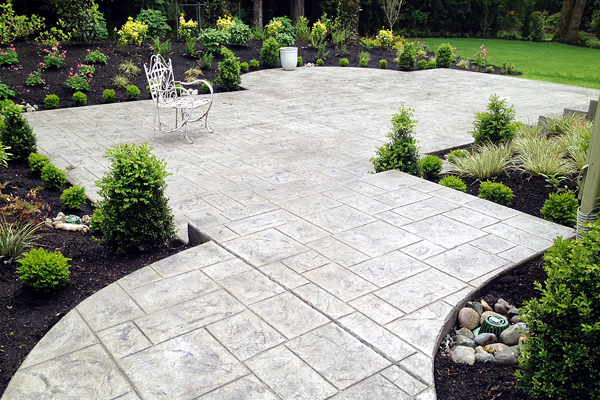 Stamped concrete, or decorative concrete, offers the most customization options in terms of pattern and color. 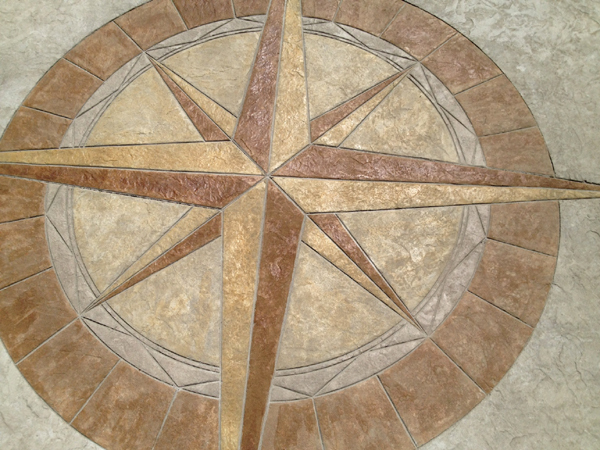 Stamped concrete replicates the patterns of materials such as flagstone, tile, brick and even wood. 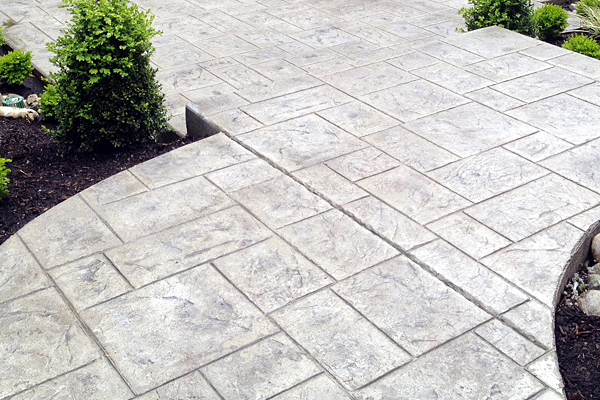 Because of this, a stamped concrete patio or driveway can have an artistic appeal. 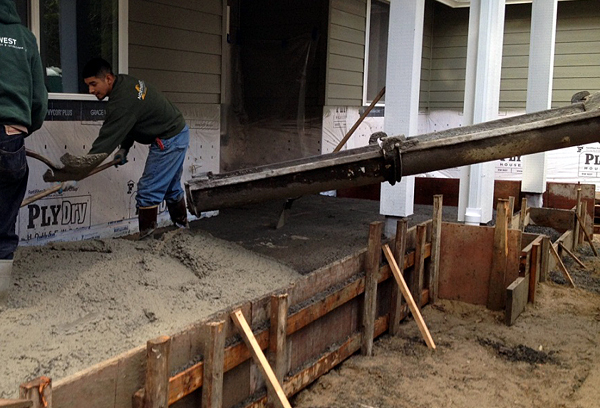 The size of the project determines how many finishers are needed to help texture or stamp the concrete. This is done by laying mats with the chosen pattern in an orderly and timely fashion, and tamping the mats as they are placed so that the concrete is imprinted with the pattern. Careful consideration is given to the placing of mats so that the pattern remains consistent to the eye. For a dynamic look, borders can be included in the design, while color can either be added to the concrete mix or applied after the concrete has been finished. 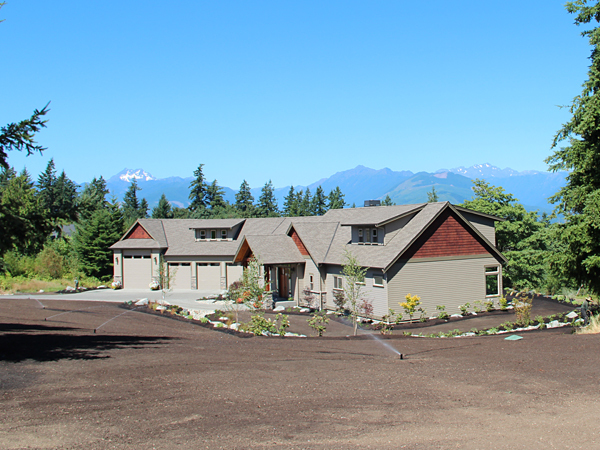 If you’re interested in learning which concrete finish would be best suited for your project, please give us a call at 360-697-3215 or email us at info@northwestcl.com. 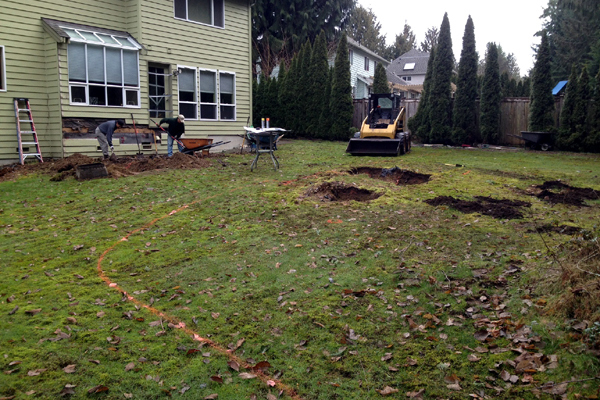 This formal backyard garden project in Silverdale was designed by Emily Russell of Russell Design Source. 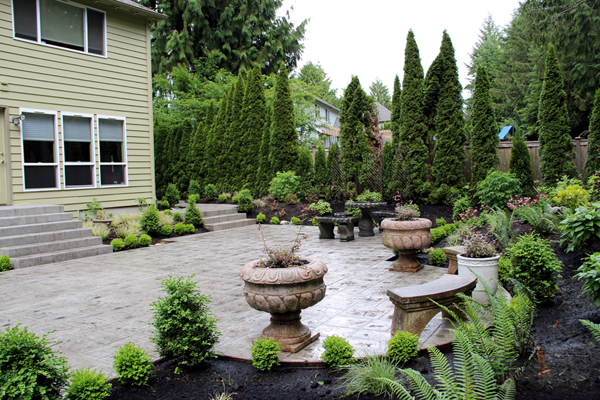 Much of the homeowner’s original lawn was removed to make way for a courtyard patio and furnishings, raised garden beds and formal, shade-tolerant plantings. 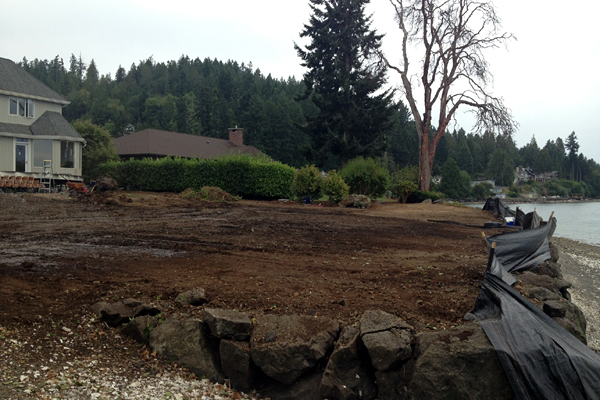 Once all of the old, mossy lawn was removed, we brought in truck loads of dark, rich organic soil to create raised beds. 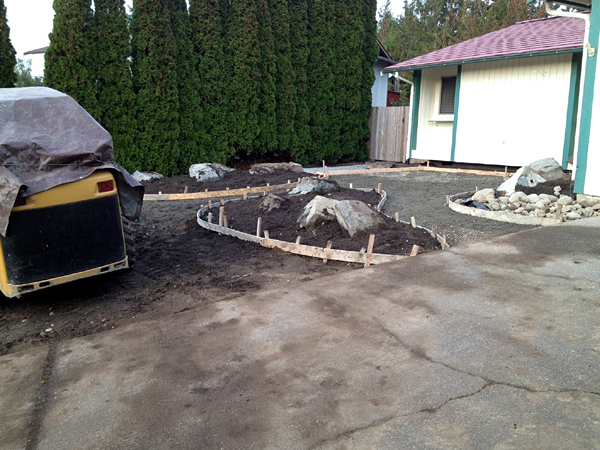 Then, we set up concrete forms for the courtyard patio and walkway located on the side of the house. 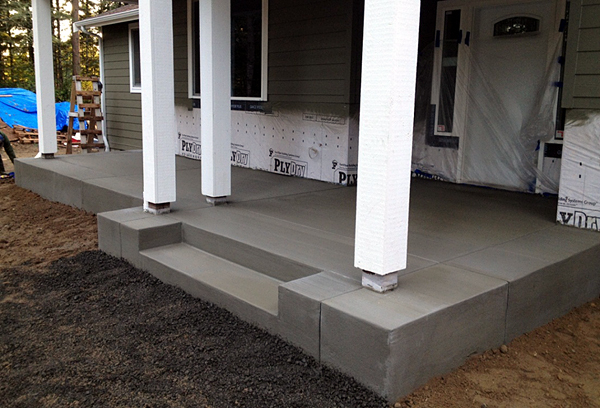 The concrete steps were poured first. Emily’s plan called for three Dwarf Southern Magnolia trees, pyramidal trees that bloom in the spring, along with shade tolerant plants such such as Lenten Rose hellebores and Old Fashion Bleeding Hearts. The leaves of Dwarf Southern Magnolias are rusty-brown on the undersides. Ashlar slate stamped concrete looks a lot like tile though is much more affordable. The concrete was antiqued, a technique used in concrete applications to create a marbling effect, and sealed to protect it from stains. This courtyard showcases the beauty of natural gray concrete. The courtyard offers a great space to gather and entertain, and the marble planters and furniture selected by the homeowner complement it beautifully. Log in to Facebook and leave us a comment below. We’d love to hear your thoughts about this project! A few of our maintenance clients have contacted us regarding tent caterpillars in their trees that are now crawling up building structures. Yiiiikes! Option 1: Live with it. The majority of affected trees survive and after the caterpillars disappear in June, the trees will leaf out again and be looking normal by August if not sooner. Option 2: Prune out the silken tents produced by the caterpillars. The best time to do this is when the caterpillars are still young. In Kitsap County, this is usually mid to late April. With an extension pruner or pole saw, you can reach up and prune out branches with tents on them. Option 3: It’s too late to do it this year, but NEXT winter when the branches are bare and easier to see, look over your tree’s branches looking for the golden egg masses of the Western Tent Caterpillar. When you find some, scrape them off. Option 4: Spray the little buggers. Don’t do it! It’s hard for me to justify the use of pesticides for purely ornamental purposes. If you’re growing food that your family relies on, that’s another matter, but no one’s going to actually suffer if your prize roses get defoliated (options 1-3 will be better for that anyway). If you’re going to ignore rule #1 then PLEASE follow rules 3-5. Read and follow the label instructions. The pesticide label is a legal document. Deviating from the label instructions is illegal and could land you in hot water. Not to mention that the instructions explain proper use of the pesticide and ignoring them could harm you, your kids, your plants, or create greater harm to the environment. Don’t spray during bloom. Most pesticides that will kill the western tent caterpillar will also kill bees attracted to your tree’s flowers. Wait until your tree is completely finished blooming. We already have enough problems with colony collapse disorder, a serious situation that’s already impacting agriculture. Seriously. Be proactive and get out there with extension pruners in April and early May or hire someone to do it for you. Use bt instead of synthetic or inorganic pesticides. Bt, formulated as a pesticide, is spores of the bacterial species Bacillus thuringiensis. It is much safer for everyone. There are various strains of this bacterial-based pesticide depending on what you want to attack. Read the product label to make sure what you buy will actually work on caterpillars (look for B. thuringiensis kurstaki). Perhaps the most important bit of advice here is to apply Bt while the caterpillars are young. Older caterpillars are much more resistant to it. Additionally, sunlight degrades Bt so apply it late in the day before the caterpillars leave their tents at night to feed. 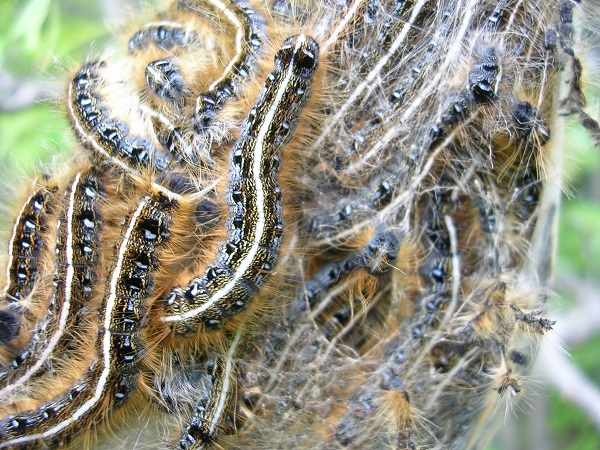 For Bt to work, it must first be ingested by the caterpillars so make sure to apply it directly to the plant’s foliage. Many thanks to Darren Strenge for taking the time to write this blog post which provides very useful information. 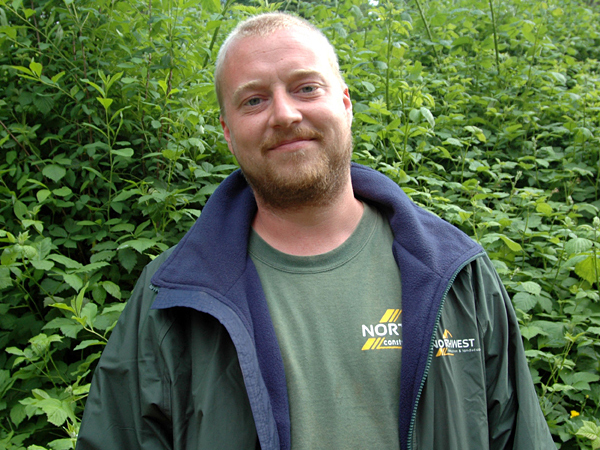 He provides pest, disease and plant health consultation to Kitsap County and be contacted at pnwbotany@gmail.com. In celebration of Earth Day, we’re giving away and planting a Coral Bark Maple tree for one lucky Facebook fan! To enter to win if you’re already a fan — share the post that announces this giveaway. New fans who ‘LIKE’ our page after seeing this post will automatically be entered to win. Only Kitsap County residents are eligible to win. Spring has definitely arrived! We encourage you to spend some time with your hands in the dirt if you haven’t done so already. Gardening is therapeutic and can lower levels of the stress hormone cortisol. If you spend a lot of time in front of a computer, it’s a great way to reconnect to the rhythm of nature. With that in mind, below is a list of key April tasks. – Seed bare or thin patches of lawn and be sure to keep the seed moist until germination. Two applications may be needed if you can’t keep the birds from feasting on your grass seed. – Watch for horsetails. Be wary of pulling them, because they’re connected. When one is pulled, it signals to the bunch to grow more. Dana Coggon, Kitsap noxious weed coordinator, recommends the snip and drip method: dripping an herbicide for horsetail control on the cut stem. – Weed and keep on weeding. Weeds pop up quickly this time of year, especially if you didn’t apply a pre-emergent herbicide to bed areas. 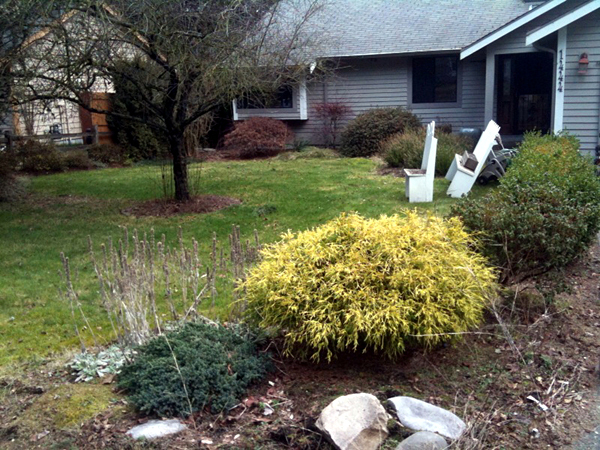 Gardening and yard care can feel like work, but the reward is a tidy landscape that you can feel proud of. Happy spring to you! After a few weeks, moss will turn black. For the DIY crowd, this would be the time to hand-rake or dethatch your lawn. Over time, grass will grow in areas where moss once thrived. To speed up the process, bare or thin areas should be re-seeded after the lawn is mowed as short as possible. We recommend JB Sun and Shade grass seed which requires at least three hours of sunlight. Remember, it’s important to keep the seed wet until germination is complete. Until the seed is well rooted, keep the soil moist at all times with light and frequent watering. 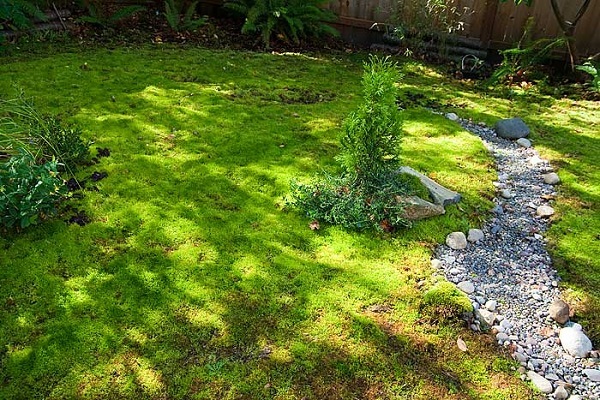 The presence of moss is an indicator that it’s time to make some changes in your landscape. If tree limbs or shrubs are creating too much shade, consider cutting them back or removing them altogether. Lack of sunlight is the most common reason for moss. In Pacific NW landscapes, this is often accompanied by moisture, and mosses love persistently wet areas in which to inhabit. Adding lime or ash to your lawn can help if your soil is acidic. Or, it may be the case that your soil is lacking in organic matter and could benefit from a topdress of soil and compost. Soil conditions will also be improved by regularly aerating your lawn to relieve soil compaction and to allow air to circulate around the grass roots. Taking the time to care for your lawn early in the season will ensure a healthy lawn to enjoy on hot, summer days. That being said, if you don’t mind the moss in your lawn, you’ll have less lawn to mow. Never a bad thing, right? 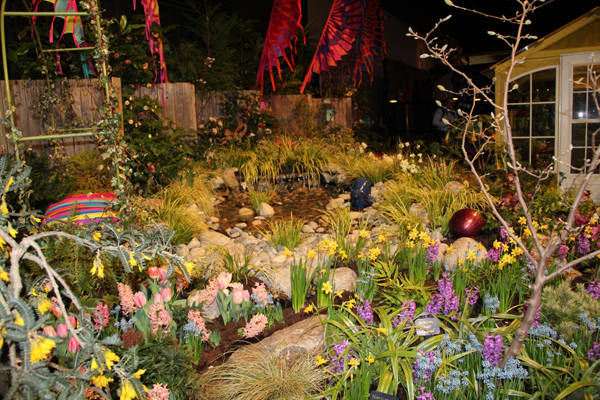 If keeping up with landscaping trends and outdoor spaces is important to you, there’s no better event to go to in the Seattle area than the Northwest Flower & Garden Show. It’s an annual destination for Colby and I, and what many local garden aficionados consider to be the harbinger of spring’s soon arrival. This year we went for one day only – on Saturday – which meant we had to bob, weave and really move in order to see everything on our list. After all, we’re talking about a show that includes a full acre of show gardens, over 300 exhibitors and vendors, and 5 days of back-to-back horticulture seminars. The show gardens are our absolute favorite thing about the show, a feeling I’m sure is shared by many. 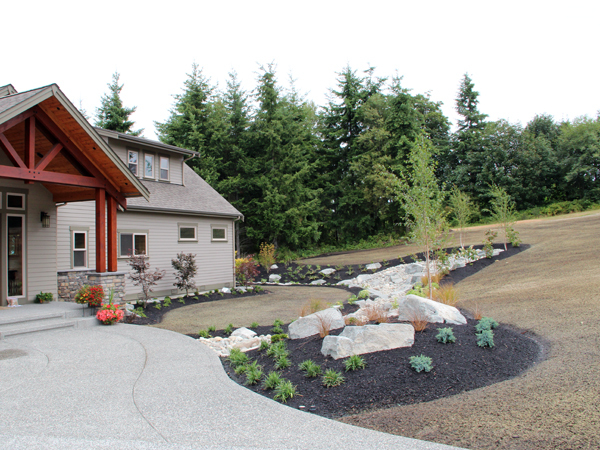 Regional landscape architects, designers, landscapers, suppliers and nurseries collaborate to create jaw-dropping show gardens which are constructed in less than 72 hours. It’s an awesome feat; you can watch the process here. This year’s theme was ‘Art in Bloom,’ so it’s no surprise that every garden featured garden art. I’m talking about serious wow factor, as these pictures corroborate. One of the first gardens we viewed was Dan & Will Robinson’s of Elandan Gardens, pictured below. 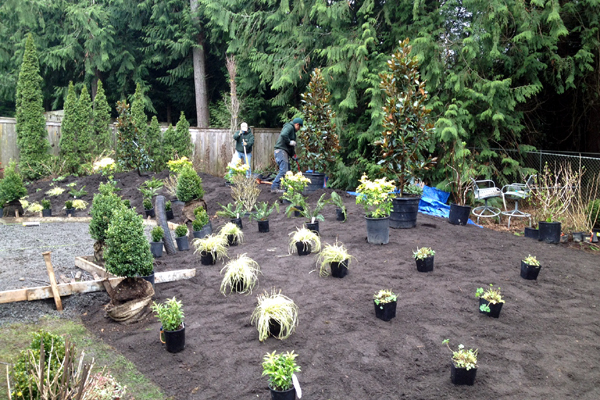 I cannot speak highly enough of Dan’s work as a designer and landscaper. Colby and I were both in awe of his artful arrangement of decorative rock, some of which appeared to be 5-man rock (landscaping speak for really, really large rocks). Even more impressive was the fact that many of the black pines included in the landscape were pruned and trained for over 50 years from seed by Dan himself. Across the way was Karen Stefonick’s show garden which, in our opinion, should have won the Founder’s Cup (Best in Show) award. 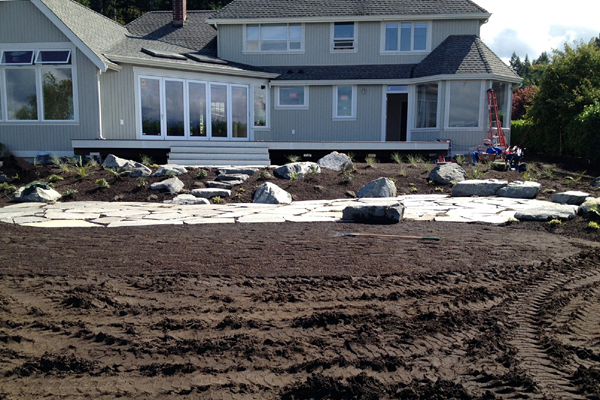 Complete Landscape, Inc and Moon Shadows Landscape Lighting, LLC installed this dramatic landscape. Elegant and meditative, this garden featured clean lines that were softened by natural rock, thoughtful plantings and a refined sense of color. A massive blown glass orchid created by Seattle glass artist Jason Gamrath reigned over the garden, while a group of striking pitcher plants created a focal point in the rectangular pond. I could have sat in this garden for hours. Colby loved the pond; we spent a good amount of time taking it in. Large metal pieces and natural elements such as driftwood felt proportionally balanced and perfectly placed, no matter where we stood. If you missed the show this year, mark your calendar for 2015 as the dates are already set for February 11 – 15. 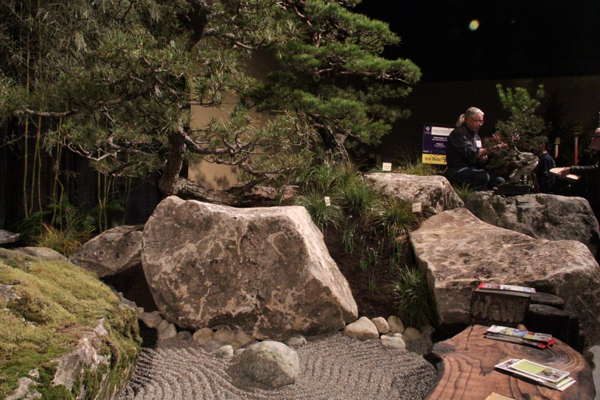 And if you did make it earlier this month, log in to Facebook and let us know which show garden was your favorite! 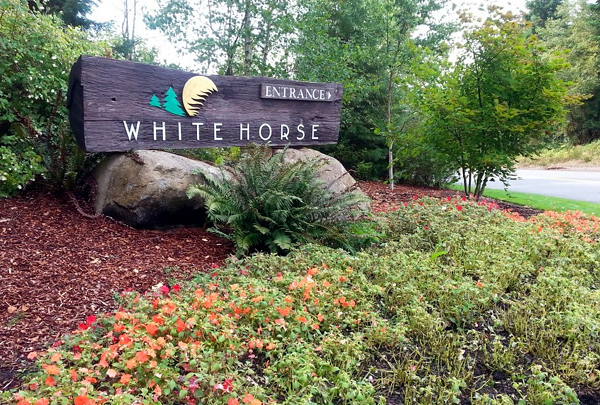 We’re excited to have recently signed on another homeowners association to our landscape maintenance client roster, the White Horse Golf Community HOA. White Horse Golf Course is Kitsap County’s premier course, and we are committed to keeping the neighboring grounds well-groomed and tidy. With the growing season soon upon us, now’s the perfect time to get a quote for maintenance services. Our employees are qualified, reliable professionals, and we operate start of the art equipment. We have full-time office support for quick response customer service. We’re already longing for afternoons spent lounging outside on an outdoor seating area, book in hand. If you’re dreaming of the perfect outdoor space and this is the year to make it happen, this project will help you visualize. Temperatures may be frigid outside, but it’s never too early to begin planning! 1. First consider, do you want the top of the material surface to be level with the ground? 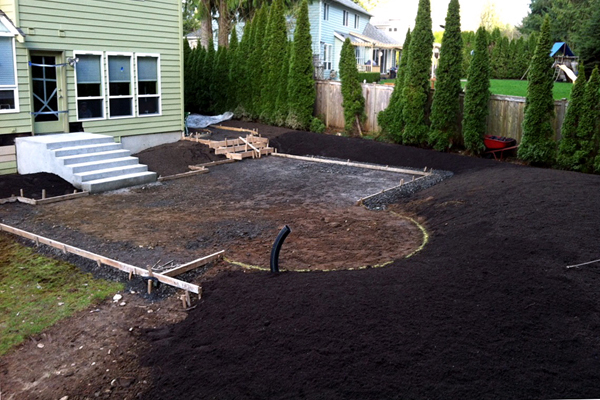 Take inventory of the dimensions of your pavers and any base materials. You may need to dig out some of the original dirt. 2. 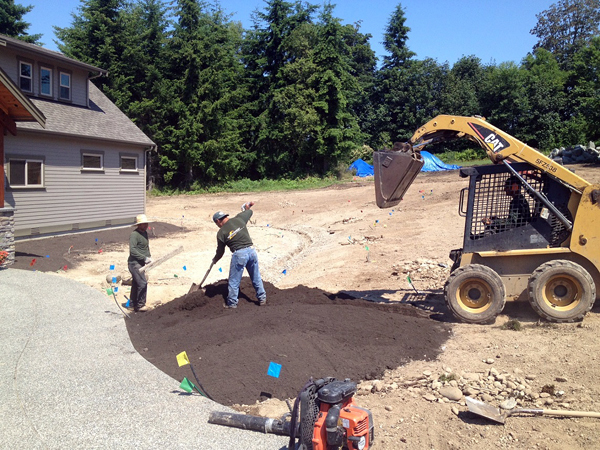 Once your sub-grade is level, install a compacted layer of 3/8 minus gravel to mitigate settling, and to keep the material installed on top of it level. 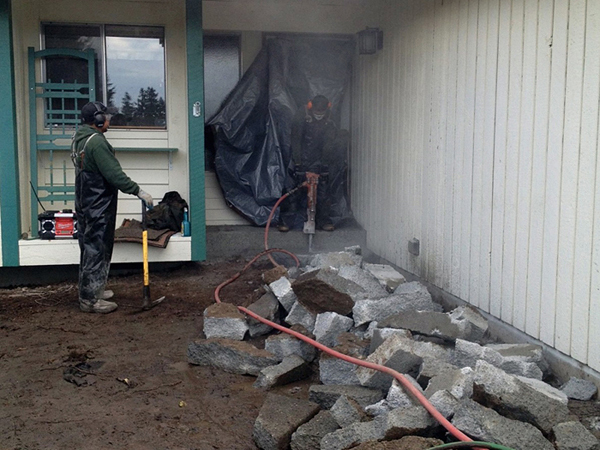 We use a compactor to do this and install at least a 2″ compacted base. This needs to be very level. Consider that a slight slope may be needed so that water can drain properly (2% or 1% is recommended). Wherever your slope is directed, keep in mind that’s where water will collect. Preparing for rainfall is an absolute must here in the Pacific Northwest. 3. Apply a 2″ layer of sand on top of gravel. 5. After pavers are laid, apply sand into the joints (the spaces between pavers), and broom the sand until all of it has fallen into the joints. 6. Now, lay a plywood sheet atop the pavers to secure the pavers and sand more firmly into place without breaking your paver material. This important step will help to mitigate them moving or shifting out of place. We use a 4×8 sheet of plywood for this along with a compactor. You’re almost done! 7. Sweep any excess sand. 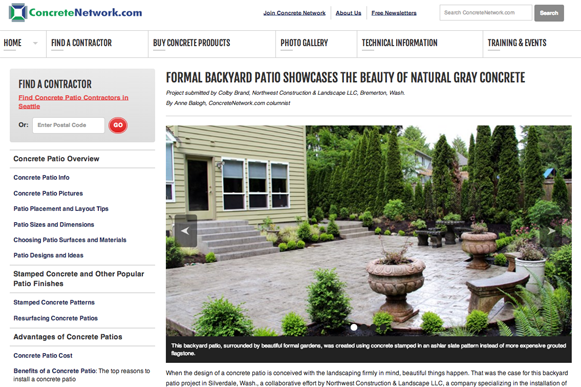 To see the multitude of square paver products available on the market and how they’ve been used in outdoor projects, click here. If you’re ready to purchase materials, click here. Once you’re finished, all that’s needed is a warm, sunny day, a good book and a glass of strawberry lemonade. If all of this sounds like more work than you have the time or energy for, give us a call or email us at info@northwestcl.com. We’d love the opportunity to help you plan and budget for your outdoor seating area. For much of the recent holiday break and well into January, Colby and I took some much needed time off to travel, unplug and recharge. 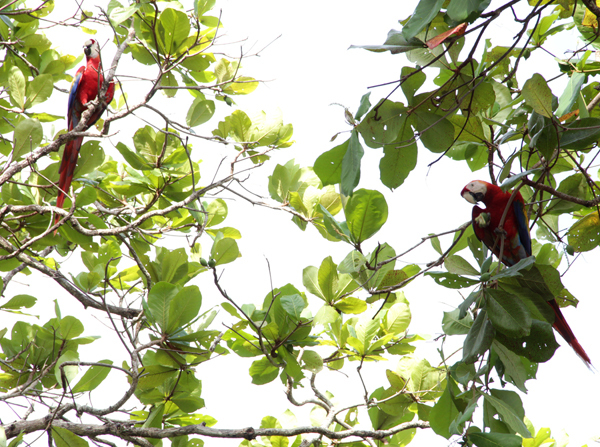 There’s no better inspiration for landscapers than turning to nature to see the flora and fauna in another part of the world. 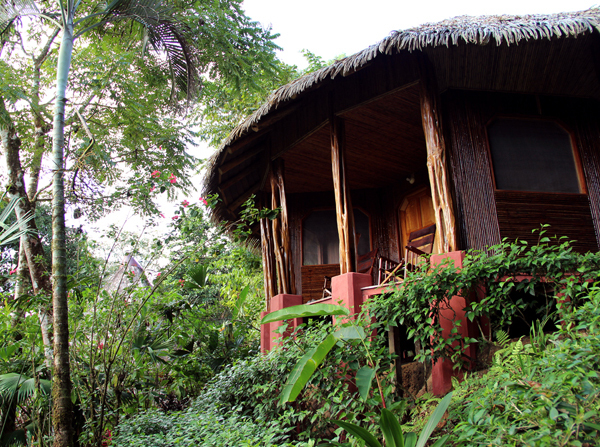 Costa Rica was our main destination; we also spent one night in Panama City and nearly a week in Cartagena, Colombia. Are we feeling fortunate? You bet. 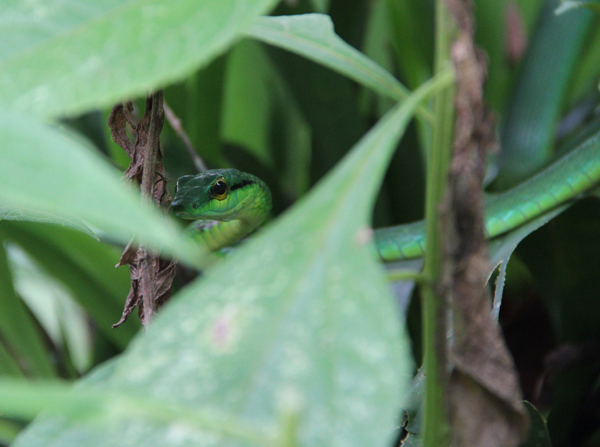 Here’s Costa Rica in seven photos. A spider monkey in the Corcovado National Park on the Osa Peninsula prepares to jump. Log in to Facebook and tell us below which is your favorite photo! There’s only 5 days ‘til Christmas, but don’t panic. If you’re in need of a gift for the garden lover in your life, here’s a thoughtfully curated list of gifts that will delight. 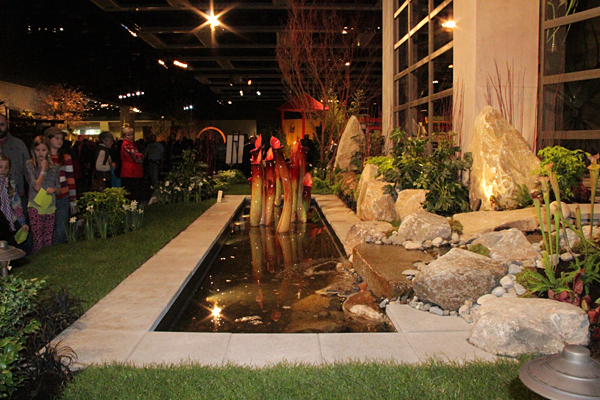 Tickets to Seattle’s Northwest Flower & Garden Show (pictured above), where landscaping inspiration abounds. Anything from the The Naked Bee line which you can find at Valley Nursery (our favorite is the Hand & Cuticle Healing Salve). A subscription to GRAY magazine, THE design magazine for the Pacific Northwest. Gaia’s Garden: A Guide to Home-Scale Permaculture by Toby Hemenway. The book’s central message is that working with nature, and not against her, results in a more beautiful, abundant, and forgiving garden. A gift certificate for online shopping at Far Reaches Farm, propagators and growers of unusual ornamentals. 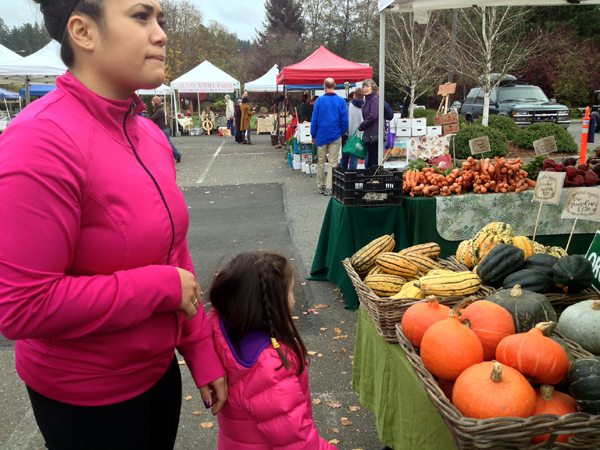 The Poulsbo Farmers Market is going strong until December 21st. It’s a great way to spend a Saturday morning or afternoon with the kids, as it teaches them the value of being connected to the food they eat. Our niece and nephew had a great time eating crepes, listening to Mino Christante play the violin, and shopping for apples, pumpkins and squash. The vendors are happy to offer up a ton of information about their produce. Violinist, singer, songwriter and teacher Mino Christante shows Preston how to play his violin. Who’s your favorite vendor at the market? Log in to Facebook and let us know in the comment section below! Create your own basket or wreath at The Brothers Greenhouses Evergreen Basket/ Wreath Workshop on Nov 23rd from 10am – noon. Cost is $50.00 and includes supplies. Located at 3200 Victory Dr SW in Port Orchard, The Brothers Greenhouses is an independent nursery whose plants are, remarkably, grown from seed or cuttings. Mark your calendars for their Christmas Season Sedum Workshop on December 14th! The trees are barely hanging on to their leaves thanks to our recent wild and windy weather! Perennials have yellowed, ready to be cut back, while evergreens show off their steadfast and enduring beauty. All signs are pointing towards winter, yet there’s still work to be done to give your landscape the best possible start come spring. Finish planting tulips and other hardy spring bulbs. Remove fallen leaves from lawn areas. Thick layers of matted leaves will block sunlight and potentially smother your lawn, especially when they’re wet. Consider leaving a light sprinkling of leaves or even mowing over the leaves on your lawn, to create a light layer of mulch that will easily decompose, adding nutrients and improving your soil. Another option is to apply a winterizer fertilizer, the most important fertilizer application of the year. Blow-out your irrigation system of remaining water to prevent pipes and components from cracking. Clean drainage ditches and repair if necessary. Drain, clean, and store garden hoses. Do you have a task to add to this list? Log into Facebook and leave a comment below! 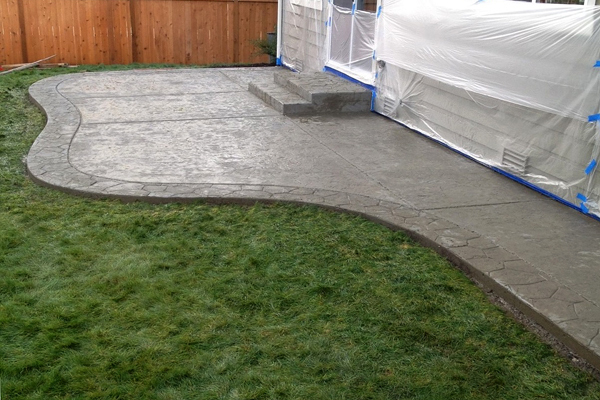 This concrete project in Port Orchard was completed in January. That’s right, January. 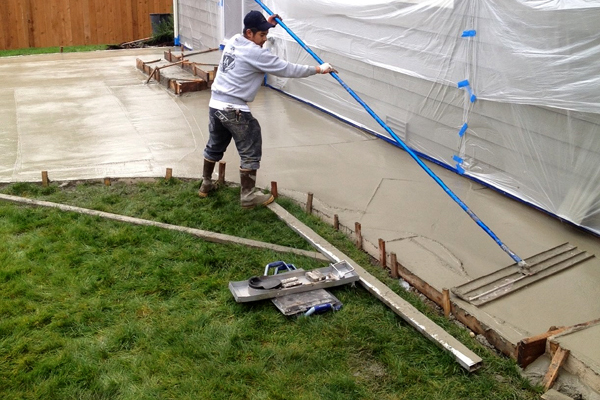 Concrete really can be poured year-round, it’s simply a matter of us watching the weather and temperatures very carefully, and being prepared with warming blankets to help the concrete to cure. 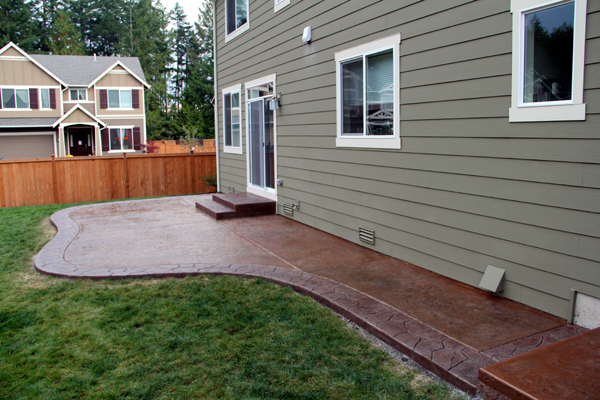 As a consumer, winter is a great time to install a concrete entryway, stamped concrete patio, walkway, or driveway, as you’ll save up to 10% on the cost of the project. If you’re in the planning and budgeting stage, give us a call. We’d be happy to help. This time of year, we’re focusing on leaf control. 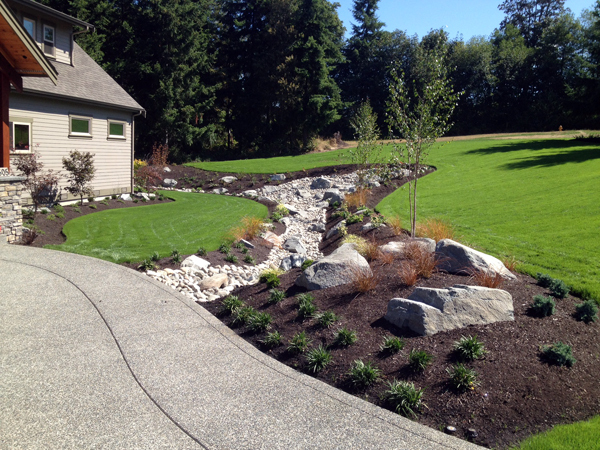 If you’d like to know what we can do for your lawn or landscape, give us a call for a free estimate! Over the last few weeks, we applied our end-of-summer round of fertilizer to our maintenance sites, a 21-7-14 mix. What does this formula mean? These numbers signify the percentage of each major nutrient included in the mix, and is known as the N-P-K ratio. N stands for Nitrogen, P for Phosphorus, and K for Potassium. Nitrogen is essential for the growth of grass blades and results in a healthy, green appearance. If your lawn exhibits a yellow-green color and produces little to no growth, it’s likely nitrogen deficient. Phosphorous encourages healthy root development and stimulates root growth. Be mindful of the amount of phosphorus in the fertilizer you use, as excess phosphorus that finds its way into nearby ponds and lakes is partly responsible for the decline in water quality. One way to mitigate this is through proper application. Potassium (also known as Potash) helps lawns to resist disease and withstand changes in weather conditions. Potassium improves a lawn’s overall ability to endure stressful conditions such as drought and excessive traffic. Fertilizer can help your lawn to recover from summer’s drought-induced dormancy. Give your lawn the nutrients it needs throughout the fall and winter months and come spring, your lawn will thrive. 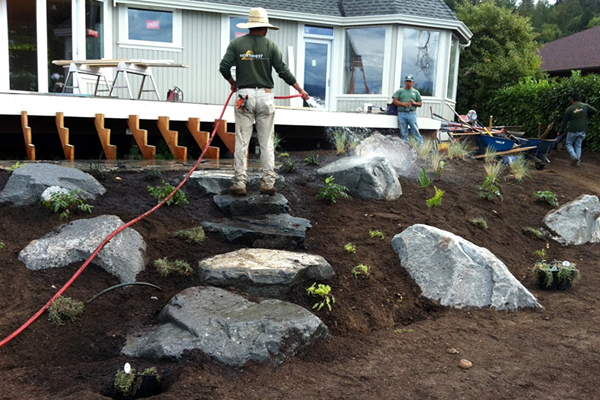 In honor of Labor Day, we’d like to introduce you to a few of the hardest working men in landscaping! We’re incredibly fortunate to have such dependable and highly trained employees on our team. 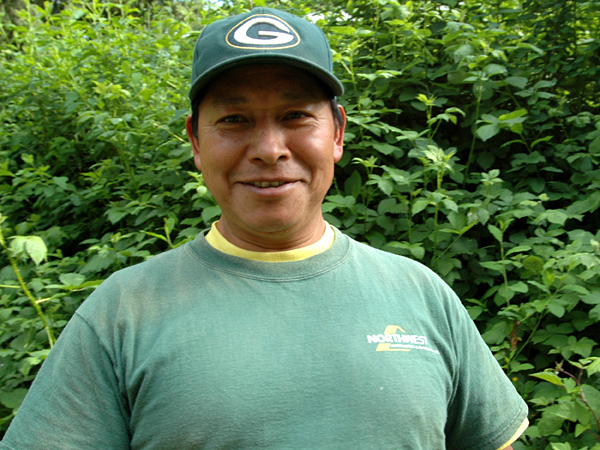 Elias is our Landscape Construction Supervisor. Our clients often tell us just how impressed they are with his technical skills and high level of service. He is the father of two beautiful young girls, and he and his wife and children reside in Bremerton. Juan is our Landscape Construction Lead. 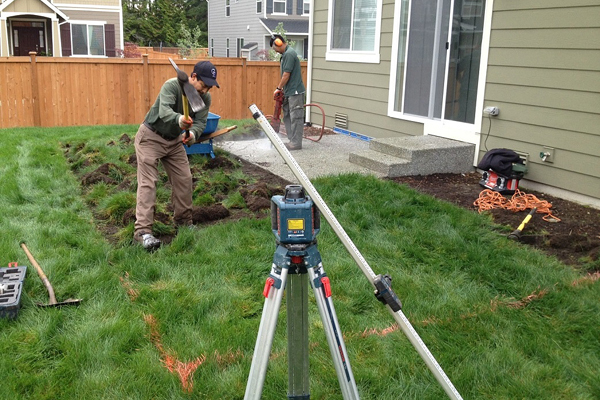 When we hire a new landscape construction crew member, they’re instructed to watch Juan in action as his form and skills are second to none. He also lives in Bremerton. Jeff is our Landscape Maintenance Supervisor. Our clients love and trust Jeff, and we greatly appreciate all that he has done to help grow our business to the level it is today. 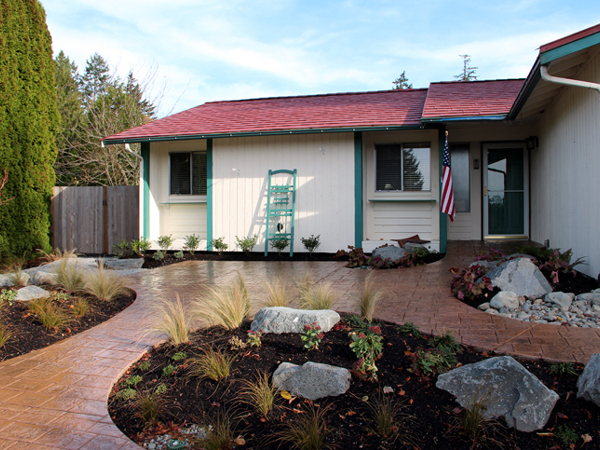 Jeff was born and raised here in Kitsap County and has worked in the landscape maintenance industry for nearly 20 years. Phillip is our Landscape Maintenance Lead. He’s demonstrated excellence in all areas of lawn and landscape maintenance, and our maintenance clients are incredibly pleased with his high quality of work, week in and week out. Phillip is a Kitsap County native and resides in Silverdale. We salute these men for their hard work! 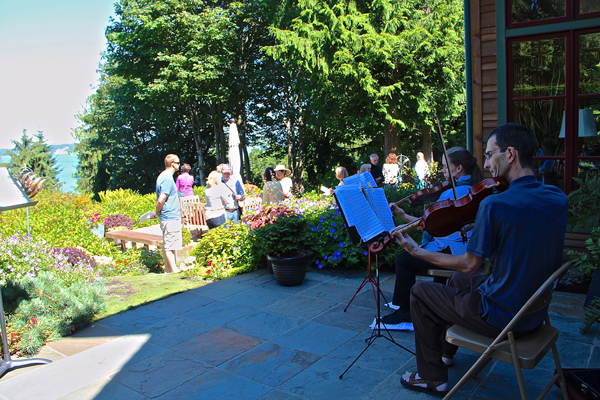 Bainbridge in Bloom celebrated its 25th anniversary earlier this month, and we were there to participate. 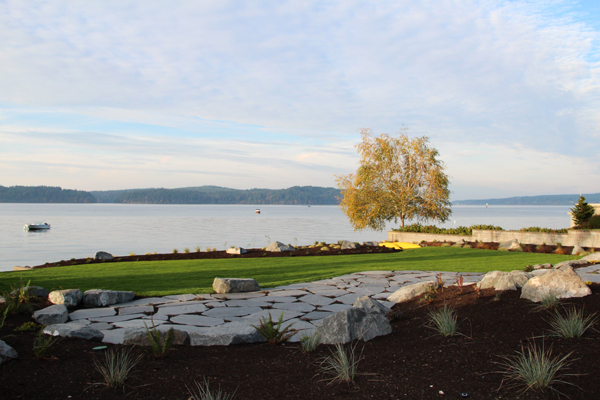 It was our very first time enjoying the self-guided tour, which featured five Bainbridge Island gardens in five different neighborhoods. If we would have gotten our act together early enough in the day, we would have had the time to see all of them, but so it goes! What we did see was nothing short of spectacular. 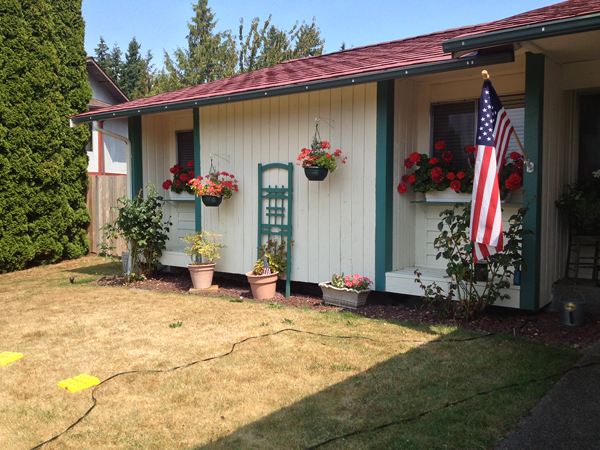 Bainbridge in Bloom is a class act! Astrantia ‘Ruby Wedding’ complements the house beautifully. Click here to see more photos from the tour! 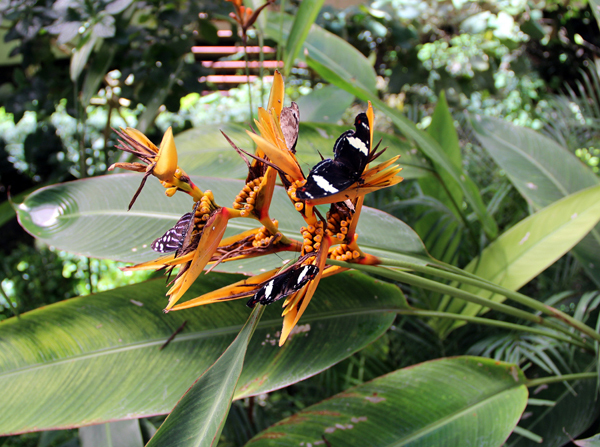 Garden aficionados are truly blessed this year, as famed Heronswood garden has been open twice already in 2013, with another open day coming up in September. Heronswood is now owned and operated by the Port Gamble S’Klallam Tribe who purchased it last summer. The S’Klallam Tribe plans community events, plant sales, and other fundraising efforts to benefit the gardens. On the last open day earlier this month, I had the pleasure to stroll through Heronswood, free to savor each trail and interesting foliage at my own leisurely pace. There was much to take in and enough photos were taken for a dozen blog posts, but this is the plant that captured my heart. 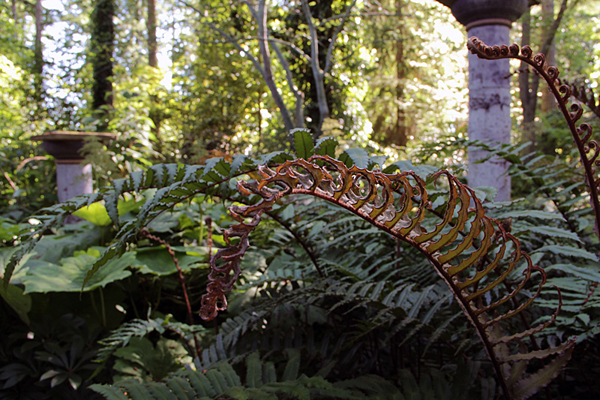 Located at the garden’s entrance, this special fern is backdropped by Little and Lewis‘ hand-cast and painted concrete pillars. Have you been to an open day this year? 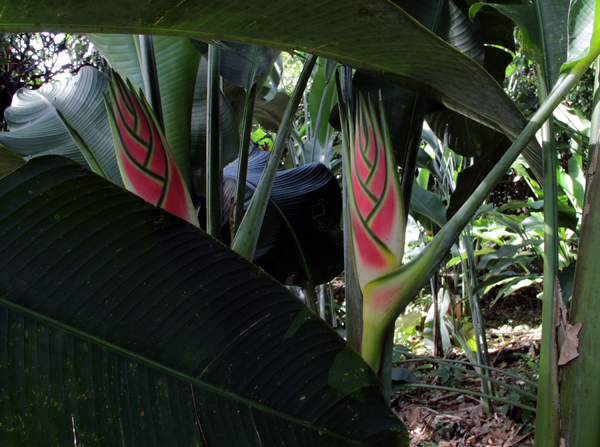 Log in to Facebook and share your favorite plant with us in the comment section below! 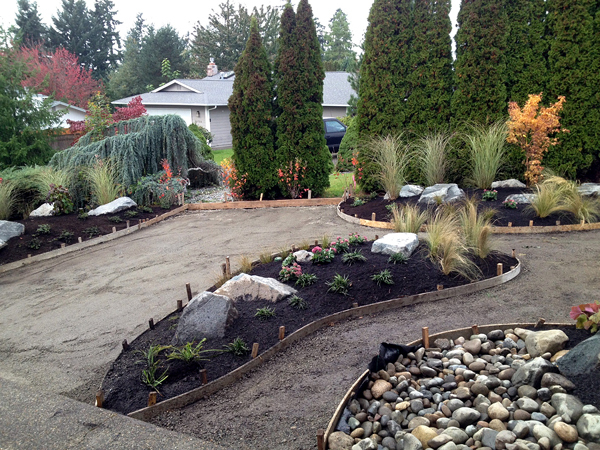 This back yard in Poulsbo called for a total transformation. The hillside was the first issue to address. 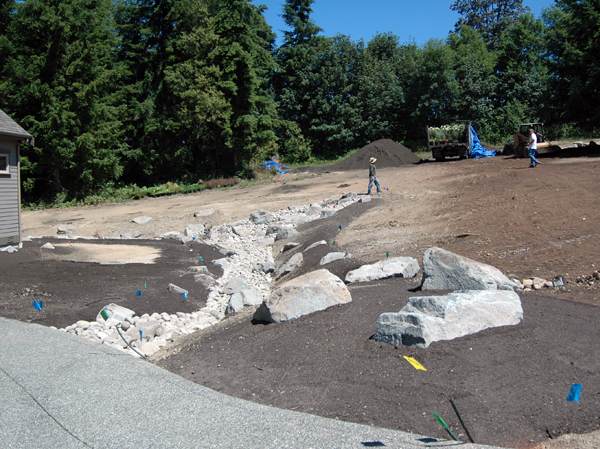 To hold the massive, existing slope in place we created a retaining wall that ensures excellent drainage. We compacted a layer of ¾ minus for the base of the wall, utilized 18-24” of drain rock behind the wall, and installed a perforated drain pipe with a sock to mitigate the possibility of wall failure due to erosion. Our client is a chef at MorMor Bistro in Poulsbo, and wanted a wood burning fire pit to cook for family and friends. The concrete was poured in phases, the first of which was the square fire pit. This landscape did not include irrigation, so we selected drought tolerant plants that require little maintenance, such as lavender, California lilac, and salvia. 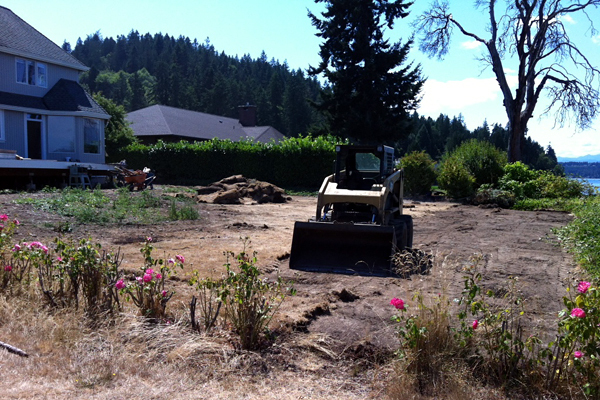 Vern’s organic topsoil was brought in and spread before hydroseed was applied. In the photo below, grass had just begun to sprout! Log into Facebook and share your comments with us below!